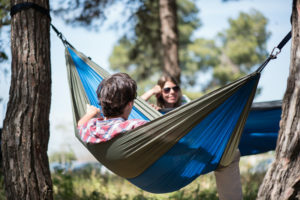 When considering a camping hammock it is important to understand several changes you will have to make in your routine. Design, Insulation, Terrain, and Protection become much more important than traditional tent camping when you decide to use an outdoor hammock as your tent. Make sure to look through several hammock companies, their reviews, and find a design that matches the area you are going to. Most camping hammocks are designed to allow the camper to lay flat. This is achieved using asymmetric designs and sleeping diagonally. This lowers the feet and head compared to day use tree hammocks and provides for a more comfortable sleep environment. People who use camping hammocks prefer this design. So when looking for a good camping hammock, find one that does not raise your head or feet too much, or preferably one developed for sleeping. It is important to understand that sleeping in a hammock is different from sleeping in a tent. You are elevated off the ground, which means you have less natural insulation. If you intend to use a camping hammock you must take additional insulation into consideration. Even a simple summer trip can be bone chilling without the proper insulation. Find a good hammock pad to place in your hammock. These can be cumbersome to use, but they do provide additional insulation below your body. You may also find a hammock that has an insert for these sleeping pads. It adds weight but makes it easier to keep the pad in place. You can also find a good hammock under quilt. This drapes from your hammock helping keep drafts away, and your body heat in. Finding suitable terrain is important for using a camping hammock. You need to find strong and sturdy trees to hang your hammock from. You can also use your natural environment to help with heat retention. If you find a spot with trees blocking the wind or a windward cliff, it can make your camping hammock much warmer during the night. Plan ahead for the area you are going into. Do not travel into a barren desert with the intent to hammock camp, instead look up info about the area and plan accordingly. Most hammocks do not provide much protection. So it is important that you take some extra consideration when looking for a camping hammock. The hammock needs to protect you against rain, wind, cold, bugs, predators, and all kinds of stuff found in the wilderness. Make sure you find a rugged hammock that can withstand the elements, and keep the creepy crawlies out. If you follow these basic considerations you should find a decent tree hammock that can be used for camping. Most hammocks do not have all these features, and you should always look at reviews to confirm you are buying a quality item. And always look for good hammock tree straps to hold your new hammock up!